Tradition takes over Thanksgiving dinner as families replay set-in-stone game plans. My grandmother always served candied sweets with marshmallows, but when I spread out the menu and wanted to serve wine, a sugary side dish didn’t fit. I jostled several sweet potato ideas until an assignment for a November supper buffet using traditional Thanksgiving basics gave me this sweet potato salad I adopted decades ago. Sweet potatoes, fully a New World vegetable, were on the scene centuries ago, even before the dawn of the white potato. European navigators in the wake of Columbus brought the sweet potato north to colonial America from Mexico and South America. These sweet, orange root vegetables give us generous doses of beta carotene and should never be called “yams,” which are tropical, bland, starchy tubers often weighing well over ten pounds each. The yam in sub-Saharan Africa finds its place alongside the cassava root and is commonly boiled, mashed, pounded and shaped into balls used to scoop up spicy stews. Botanically the yam is in the grass family while the sweet potato is a member of the morning glory clan. Here’s a do-ahead dish that doesn’t need to be reheated, a dish for a day too busy with turkey and gravy. It’s light, zesty and gives a great splash of color on each plate. Choose evenly sized sweet potatoes to bake or steam; the only slightly unusual extra you’ll need to have on hand is fresh ginger. This salad keeps well and will be a hearty complement to leftover turkey sandwiches. Bake sweet potatoes on small sheet pan in 350°F to 400°F oven until soft. Meanwhile, chop onion; peel and cut carrot into 1/8-inch dice. Steam or blanch carrot briefly to intensify color. Carrot should retain a bite. Make vinaigrette with garlic, vinegar, lemon juice, ginger and oil. As soon as baked sweet potatoes can be handled (be sure to work with them while they are still very warm), peel and cut sweet potatoes into large dice. Many of them will break apart, but that is O.K. In a shallow, large bowl, fold onion, carrot and vinaigrette mixture into diced, warm sweet potatoes. 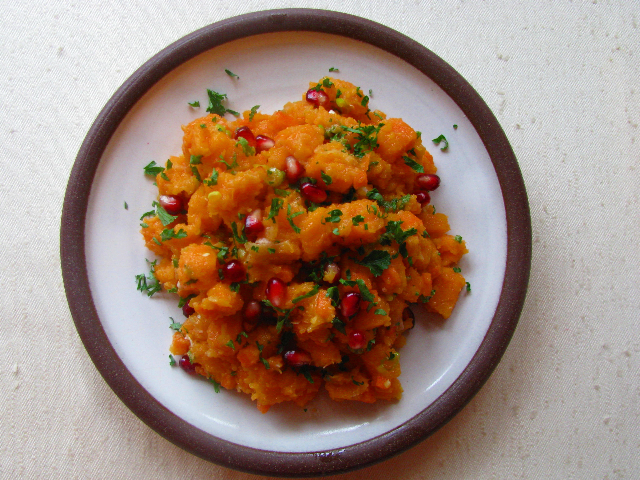 Season with salt and pepper, more lemon if needed; garnish with pomegranate seeds and parsley. Makes a generous pound, enough for 4-6. Serve at room temperature. You are currently browsing the Mary Jo's Kitchen blog archives for November, 2011.